X-Fest proved to be a very big Rankings-Grab for those who participated and did well. Coming in with two-times the points and using results from three divisions, players outside the top 60 made big leaps. Armando Ortiz, sitting outside the top 40 made the biggest jump when he landed at 13. Sean Lenning, Dave Fink, Vic Perez and Kevin Gonza made their outdoor rankings debut of 2016 with a jump to the 22nd position in a multiple-way-tie. Samzon Hernandez finally broke into the top 10 after a slow beginning to the season; meanwhile, Shorty Ruiz forged his way to the #3 spot. Only seven points separate #7 from #10; while, Chava Cordova and Kevin Gonzalez are divided by just one single point at #5 and #6, respectively. That leaves us with the two leaders atop the board–Juan Santos & Timothy Gonzalez. Despite winning the Xrossover last weekend in Marina Park, Gonzalez did not take over the #1 spot. Santos held onto the lead for his 18th straight month, although the gap between the two narrowed; nine point difference after Vegas in May compared to just five points after Marina. 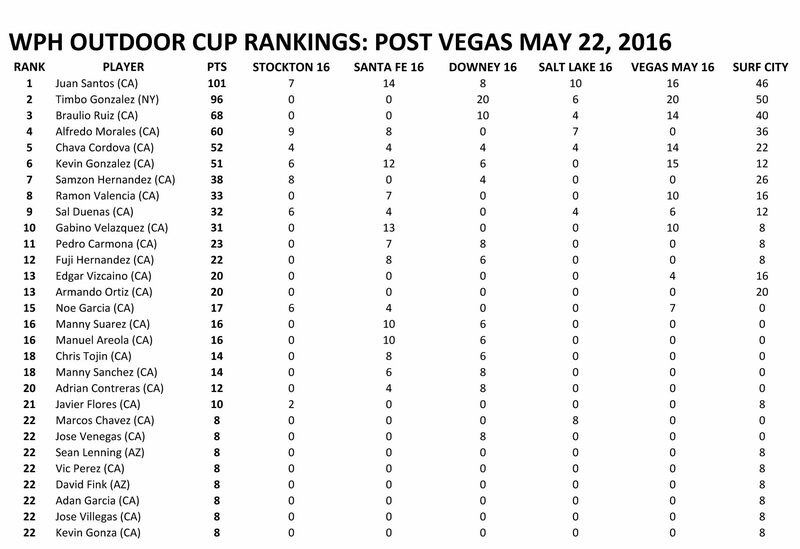 WPH will use results from up to four events at the season finale in Vegas (Sept). In the Women’s Bracket it’s a four (wo)man race with Tanisha Groomes narrowly leading Ciana Ni Churraoin by a couple flimsy points; Catriona Casey and Tracy Davis are tied for third place; while just nine total points separate #1 from #4. Rankings include A Singles (pro) and A Doubles (pro) results from the RD 8 to 1st Place and may take a player’s best results from three divisions if 1 Wall and/or small ball is offered. Points are allotted as: 1st 10pts, 2nd 8pts, 3rd 7pts (6pts if only semifinals), 4th 6pts, 5th-8th 4pts, (player(s) must win at least one match to get points when applicable; player may lose points if no-show or forfeit). Some stops bring .50 points (Ie. Iceman Stockton winners received 5 points for singles and doubles for 1st, as opposed to 10). In Vegas 2016, rankings will be boosted by 1.5 times for small & big ball singles/doubles (1 & 3 wall) if those divisions are offered. Mixed pro doubles will not be a ranking event. If the bracket has less than 16 players that bracket will offer 1/2 points (in the case of Vegas 16 if, as an example, 1 wall pro small ball singles has just 8 players, the winner will receive 1/2 of the 10 max points being offered. If a pro division has less than 5 players, than that division would bring 1/4 total points (ie. 2.5 for first place, etc). Race Vegas will use the best three of four of your best results to determine the Cup Champ and bonuses will be paid out to the top four players (if those four show up at the Simple Green US Open as a “paid” participant). Questions? Contact the WPH: info@wphlive.tv. WPH will seed events by giving the #1 player and #2 player the #1 & #2 seeds, respectively. #3 and #4 ranked pros will be seeded #3 & #4 by coin flip. #5-#8 will be pulled out of a hat in a blind draw. #9-#16 will then be drawn from a hat in a blind draw.